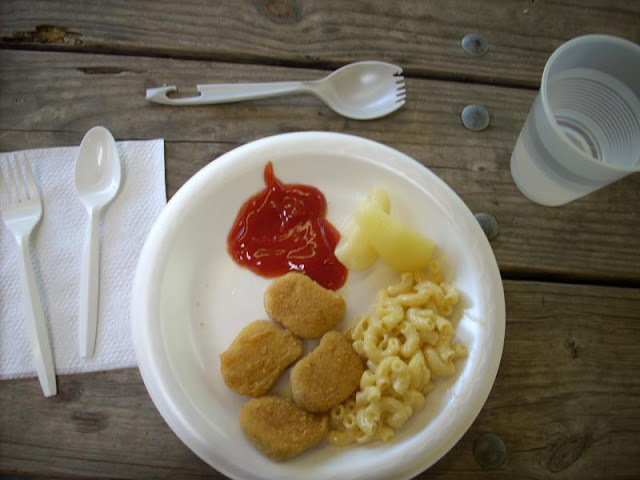 food at camp is not the best but it is good enough. 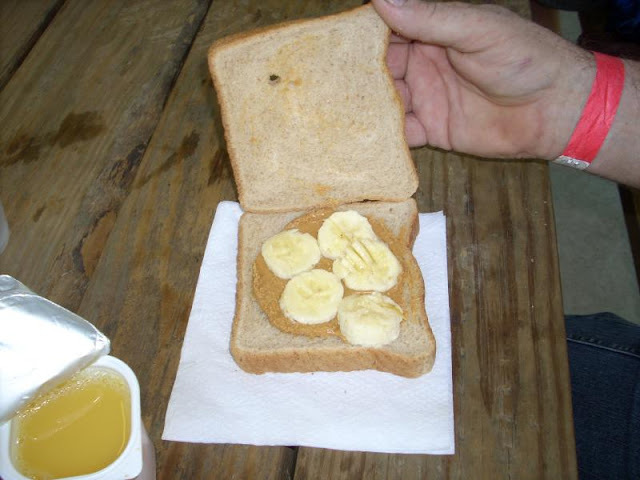 camp food is probably cheap because they wouldn't spend that much money on us but its still good. On Monday we had waffles and bacon for breakfast. For lunch we had ham and cheese with tomato soup. At dinner we had Beefaroni with meatballs, green beans and garlic bread. On Tuesday we had pancakes for breakfast with bacon as a side. for lunch we had a BBQ pork sandwich with salad. 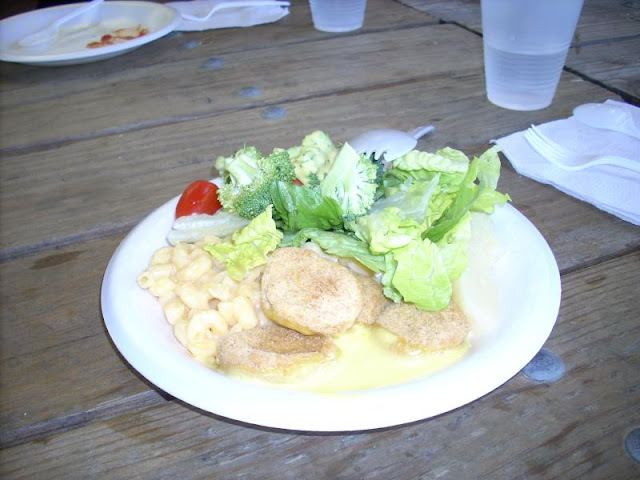 At dinner we had corn, turkey, mash potatoes and salad. The P B & J tasted weird at first but we go use to it and they taste great now. They haven't run out of bread, peanut butter, and jelly yet. I like their choice of jelly, it's my favorite. Tuesday at camp we had a pizza party with Troop 117. The pizza was good while we played cards for camp night. We also had bug juice, water, and frute punch. At the Trading Post they have tons of snacks. It is amazing. They have ice cream, soda, candy and beef jerkey. Mr. Kyle is our wonderful dining pavilion steward. One of his duties is to police the salad bar. The salad bar had condiments that you could also put on your sandwich or other food. It was served at lunch and dinner. The dressings include an excellent ranch. For a couple days, there was ham and turkey. The bug juice was only served at lunch and dinner. The flavors included fruit punch and orange. It was mixed strongly and had good flavor. It was always cold too. 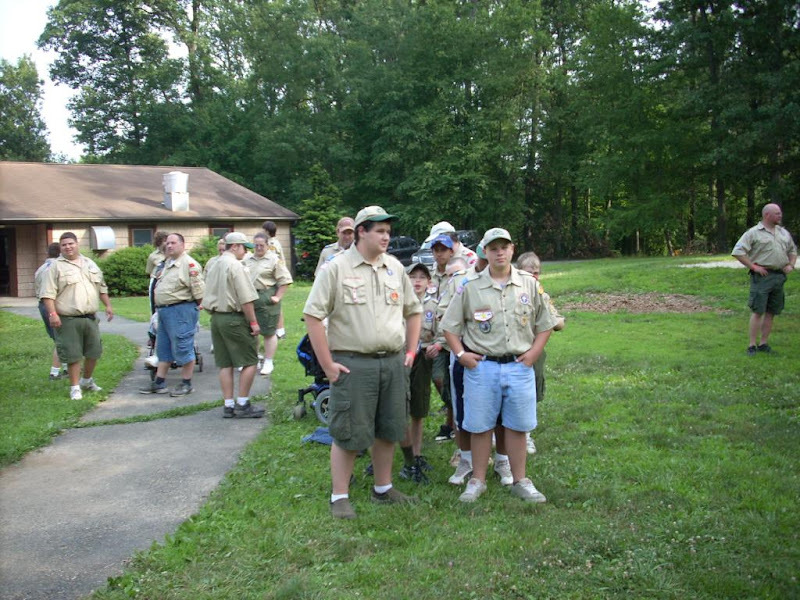 Some Scouts thought they saw bugs in the bug juice, but most did not notice. 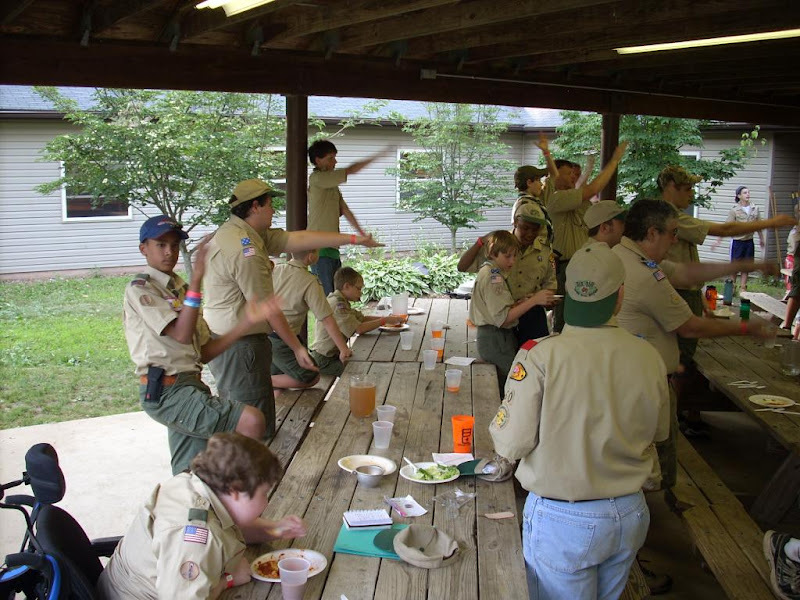 Scouts should drink more water than bug juice and much less soda. Today for breakfast we had English Muffins, eggs, hash browns, and bacon. 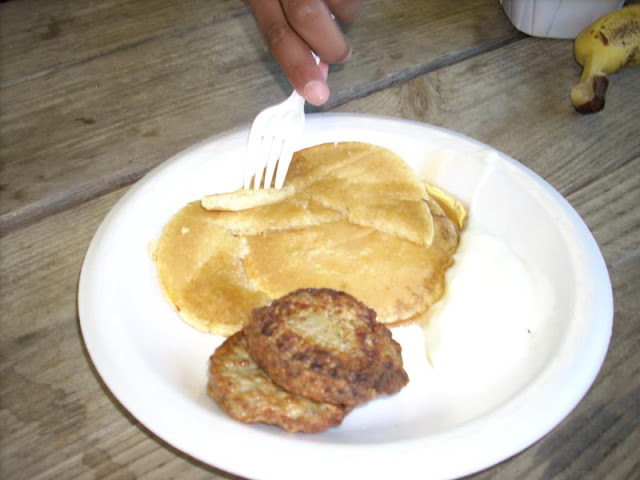 Some said the hash browns were dry and the English Muffins tasted like cardboard, while others said it was delicious. There might be a guest blog post for day three - it depends on how quickly the Scouts taking Computers merit badge can get their tasks done. 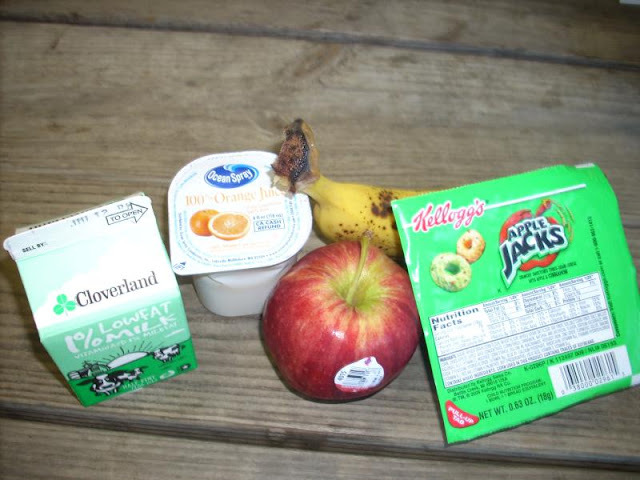 Adding pictures is a pain, because the iPad blanks out image upload on the google blogger site. In order to embed a picture, I have had to resort to transferring images using the PC or Droid phone, figuring out the URL, and adding that via HTML to the content. Not a good lesson to show Scouts trying to learn computer basics. One Scout in the class saw the iPad and said "but it doesn't handle Flash". Religion choices already made at such a young age! Wednesday night we went to Scout Vesper service, where camp chaplain Scott Gray told the story of "Unfortunate Tao", a tale of an empirical succession in ancient China. Scouts are also collecting for the World Freedom Fund, which is supposed to help improve Scouting opportunities in other countries. 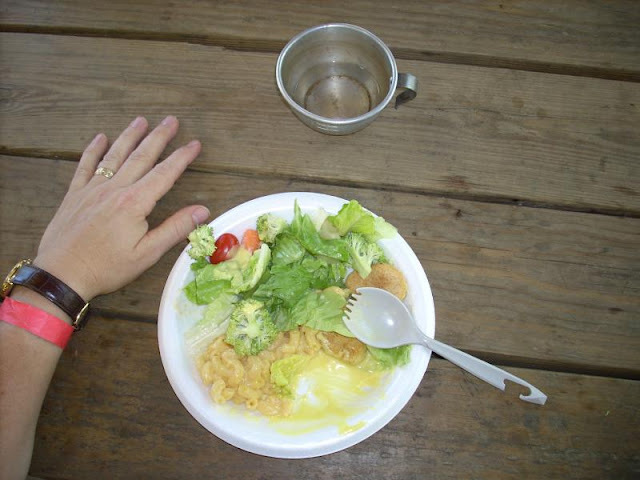 The first two photos below are in Panoramio, taken at a couple sites in Camp Spencer. I shot them with the Nikon cool-pix camera, then uploaded them through the PC to the web. Still trying to figure out how to move images from the iPad to the internet, and assuming the I in iPad stands for me-me-me, not the Interwebs. 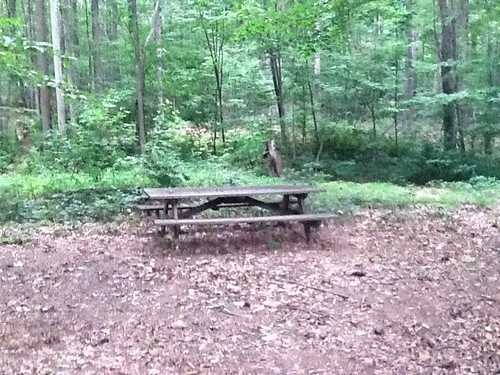 The next seven pictures are from different scenes around camp, not in any particular order. One and seven are from trail work. Two and three are from computers and cooking merit badges (should be obvious which is which ). 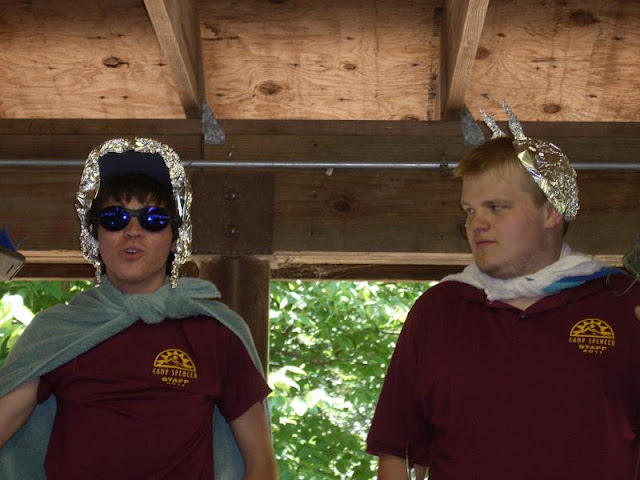 Picture four is a Staff song/skit, something about Junior Bird Men, with appropriate headgear. 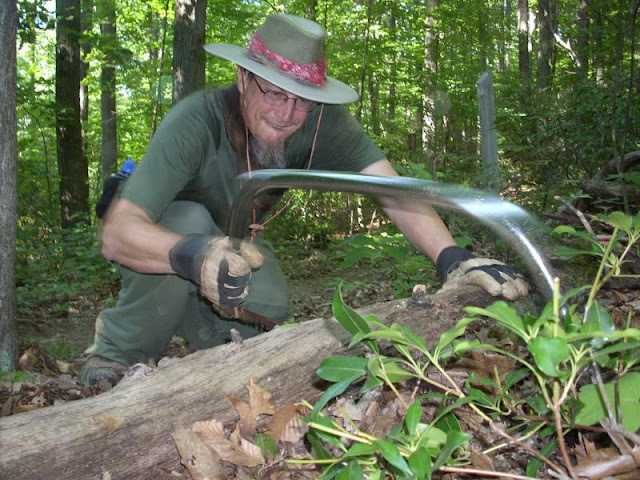 Photo five is the Scoutmaster coffee station, and picture six is Zachary picking at some vegetation outside Hansen Lodge, where Troop 117 is staying. Since Monday's fire drill, camp has been a beehive of activity, so to speak. 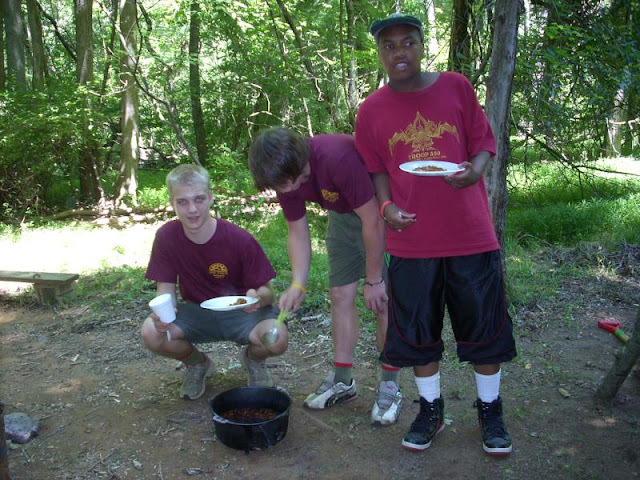 We are hosting 3 provisional campers from another troop, who have fit in very well with the relaxed pace of our troop. Although one has the same first name as one of our regular troop members, and the other two have the same name, we've come up with appropriate nicknames - Aaron with an A is A-Aaron, and Erin with a E is E-Erin. Isaac taking BSA Scuba is "Scuba Isaac" though the other Isaac is just Isaac. 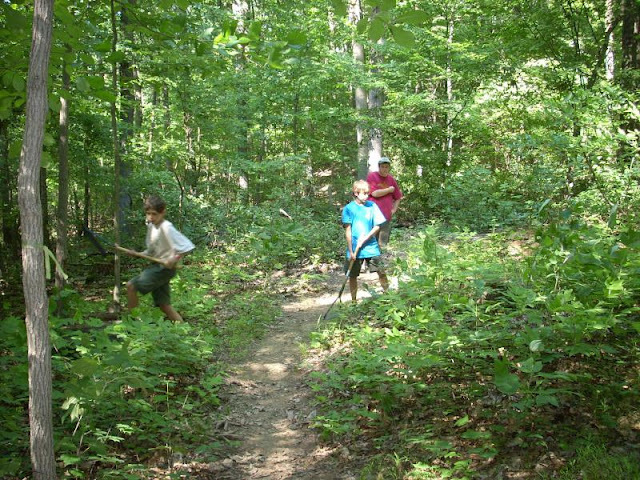 We have a Con-Ec project to do, one that our troop started working on earlier this year on a weekend camping trip; we will complete trail maintenance on the Spencer Nature Trail, which bleeds into the Red Trail (also known as the Broad Creek Trail now). The effort will be mainly grass whipping, with maybe one or two water bars thrown in for good measure. It's too bad that the trail does not look well-used, and that many of the numbered station posts are out of the ground. 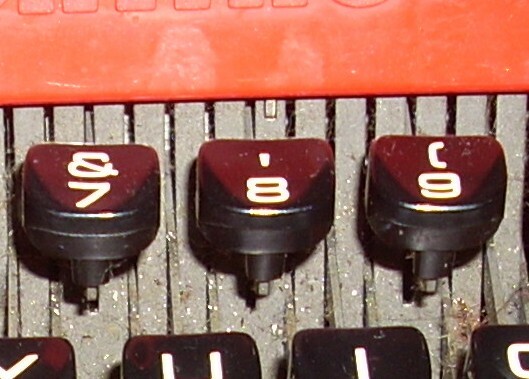 Without knowing their original purpose, it is hard to site them properly. We decided not to tackle post hole digging with the current troop alignment. 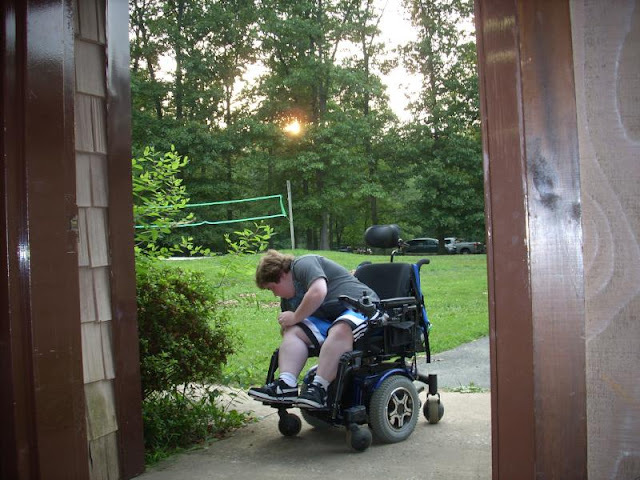 Monday night was a camp-wide game called "Staff Hunt" where each Unit in camp sent out patrols to locate Spencer staff and return then gently to the dining pavilion area. 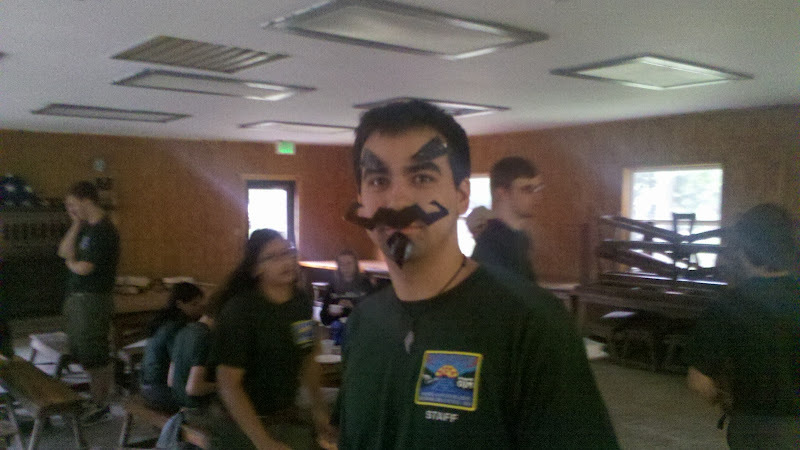 One of our Scouts was injured right before camp and we've been trying to convince him to get into the woods. It's a shame to waste an opportunity that only comes around once per year. Maybe tomorrow he will feel well enou to venture away from his home base. The site inspection Tuesday was better than the day before; we earned a score of 100 percent on the cleanliness of our camp and other safety factors. 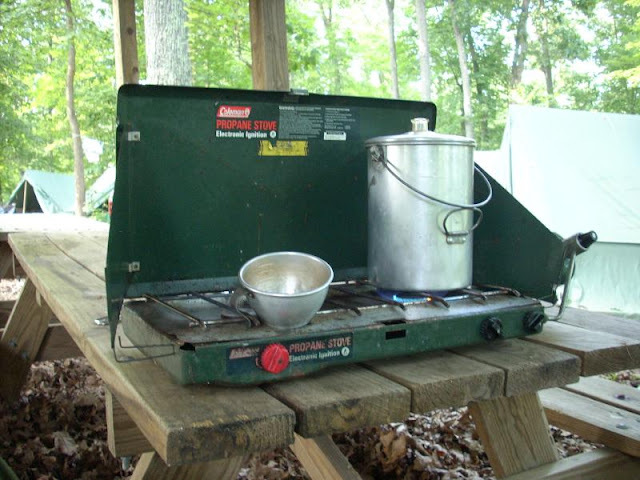 This is just one of the requirements for a Troop award from the Scout camp. Some of the others are going to be tough to achieve. We'll see what happens. The Early Bird swim is set for Tuesday and Thursday - one of our adults and two Scouts passed me this morning, heading to the pool as I was heading back from the shower house (before 6 AM :-). 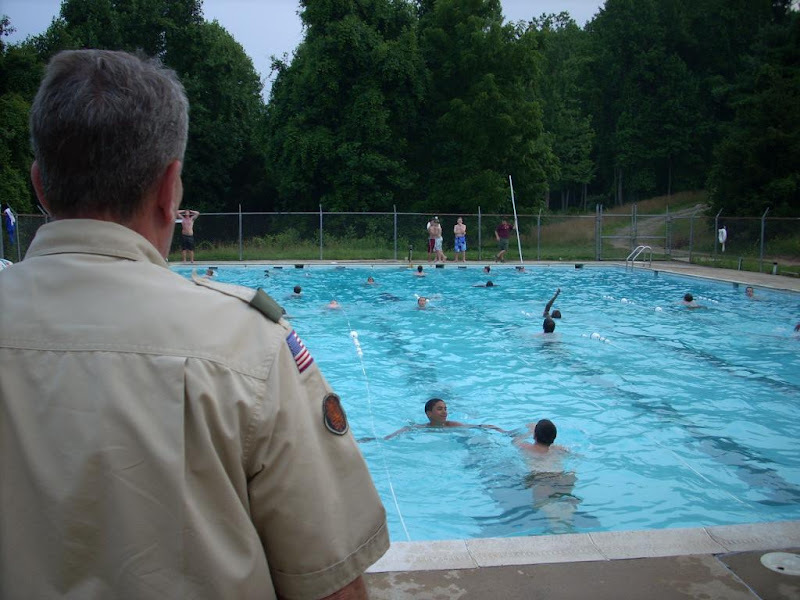 Monday night was the quarter mile swim, for those trying to do the mile swim on Thursday, and for those Scouts taking Lifesaving merit badge. We have four in the latter category and three of them completed the daunting swim. One was so tired from late night chatter he seemed to run out of steam. Let's hope he can get another chance this week, as pool time is not easy to set up. Tonight is Troop Night, where we can either host a campfire program or visit another site who invited us to their program. We will go to Hansen Lodge where Troop 117 is planning to serve Boy Scout popcorn and have games to play. I picked up some cookies and other snacks at the Dublin Market, including soft chocolate chip cookies as requested by Mr. Louie. Summer camp, day one,try three. Sunday arrival, followed by health re-checks, and swimming tests. 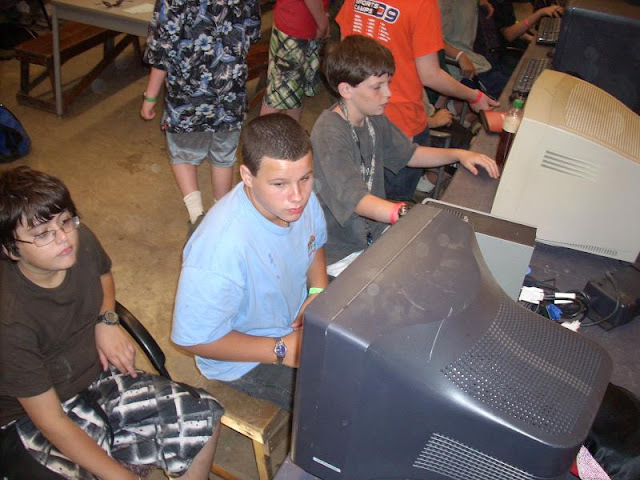 Typing this at the Scouting Academy, formerly known as the First Year Camper program at Camp Spencer, Broad Creek Memorial Scout Reservation. Leaving for camp Sunday morning was the usual confusion with getting last minute health data, checking phone numbers, and, reminiscent of sandlot baseball team picking, deciding who rides in which car. I should have had a bit more coffee for the ride, as I was beat when we reached Camp Spencer. Check-in started at 1 pm, and we made it to camp a half hour ahead of that. With staff still shaking down the process, the typical pinball bouncing around occurred before the official time approached. I sidled up next to the registration desk at a few minutes before 1 pm, and was able to get our troop through staff host assignment quickly. The goal of starting medical checks at 1:30 seemed optimistic, given how slowly the site inspection and tent assignment process usually goes. But we made it to the dining hall and through swim checks with little hassle. Using the newly won iPad and the now venerable Droid 2 as the mobile hot spot while in the woods has presented some new challenges and learning opportunities or, more simply, hassles. The biggest pain has been trying to figure out how to get digital images from either the iPad or a digital camera and then put the image tags in this blog. Blogspot itself has been a little flaky, though how much of that is beginners non-luck and how much actual bugginess I am unsure. Sites like flickr and picasa have each put roadblocks in front of the methods I have used for years to embed images. I resorted to sticking the memory card in the phone, rebooting in the process and other tricks like emailing myself picture linkPs. OK, fire drill at camp. Gotta go! 1973, the year of living fairly dangerously. 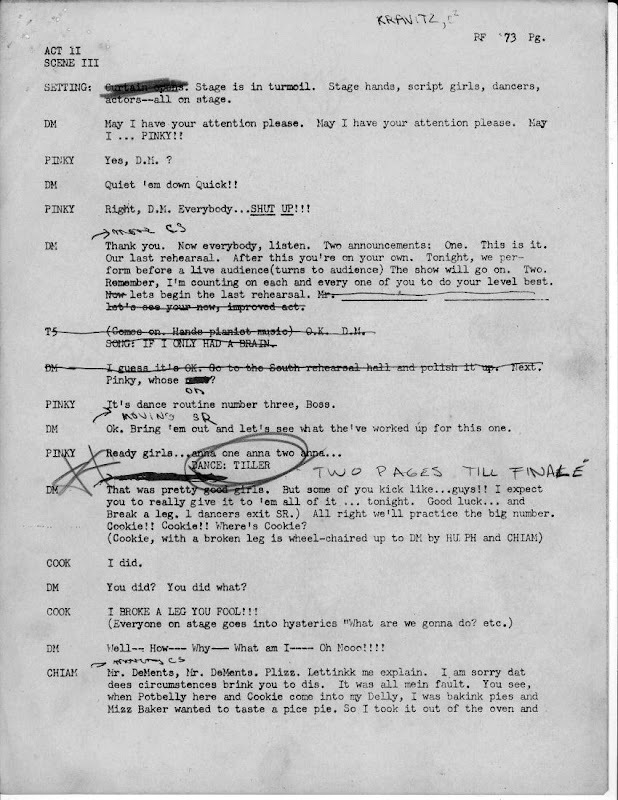 Page 1 of the script for "The 1973 Poly Follies" ("52nd Annual"). 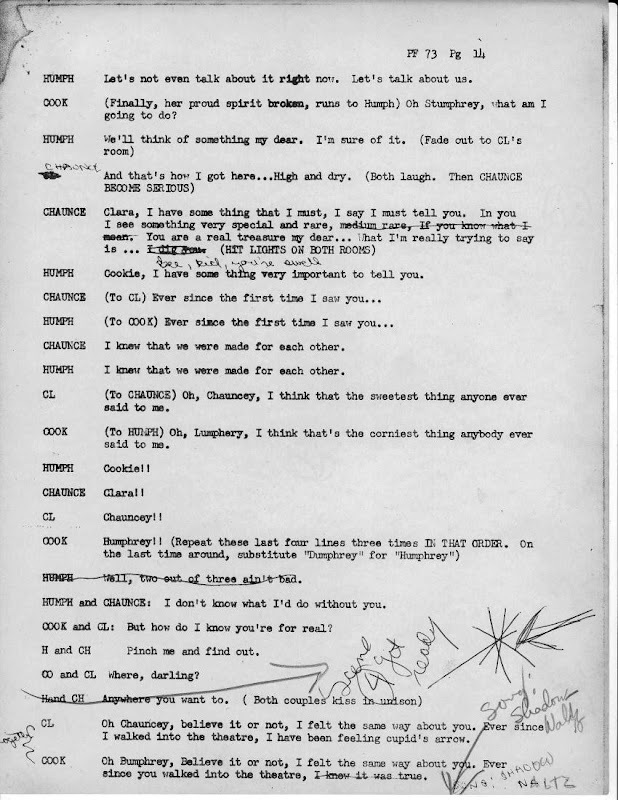 This copy has been squirreled away in my file cabinet for years, and I only thought about it recently when chatting with Carl Hyman, one of the co-writers, along with Tom Stevenson, and me. The story is getting fuzzier over the years, and is worth embellishing on. The first page seems to have faded more than the others, though one can read most of it in this scanned and enhanced, yet shrunken reproduction. Per tradition, the Poly Follies opening musical number (after an orchestral warm up or overture) was "Another Opening, Another Show". This was taken from the musical "Kiss Me Late", which played on Broadway in the late 1940s through early the early 1950s. 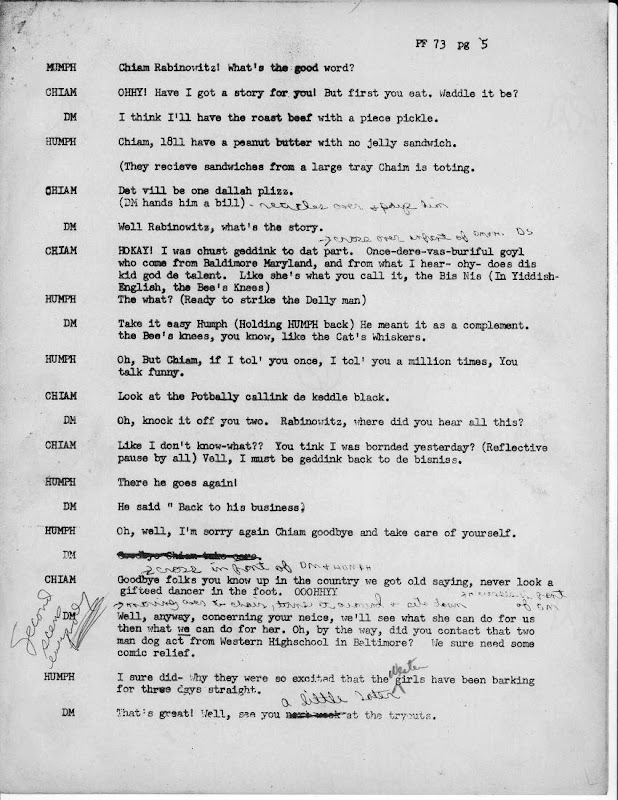 According to the Internet Broadway Database, that play was set in Baltimore's Ford's Theater in June 1948. Did we have permission to use the music and lyrics? Good question, teacher! 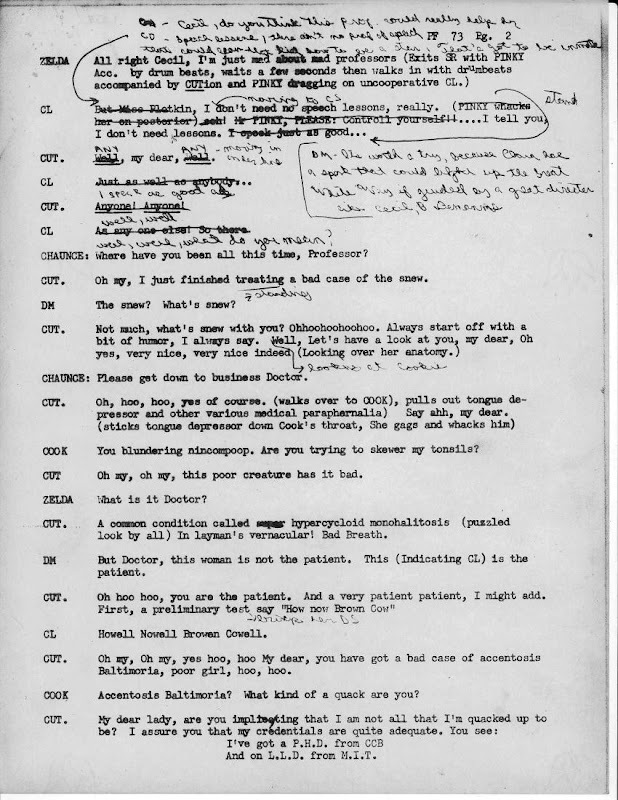 The script was mimeographed, I assume, though as I recall we wrote it out longhand on yellow legal paper. The 3 of us would gather after school, often at Tom's house in Northwood as I recall, but presumably at the school and other locations. 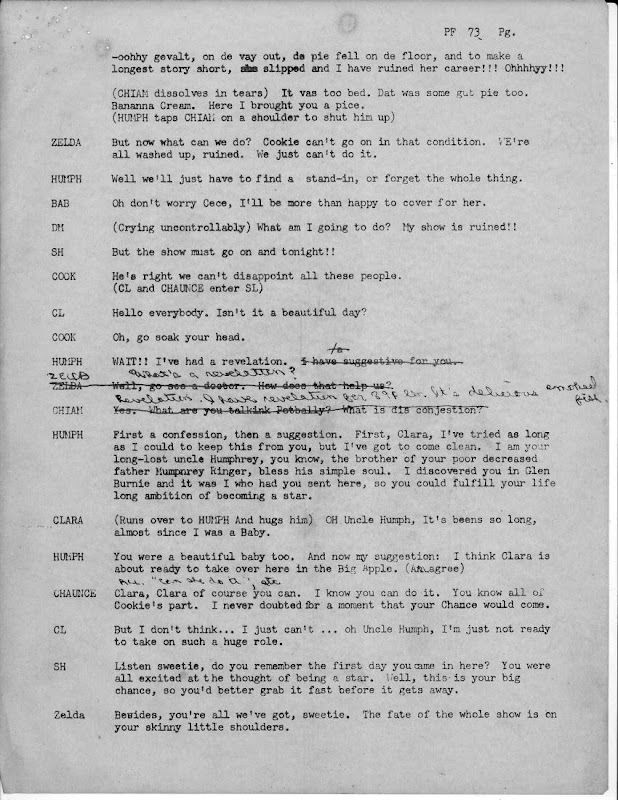 This script was used in the production of the play, as the stage or prop managers version. 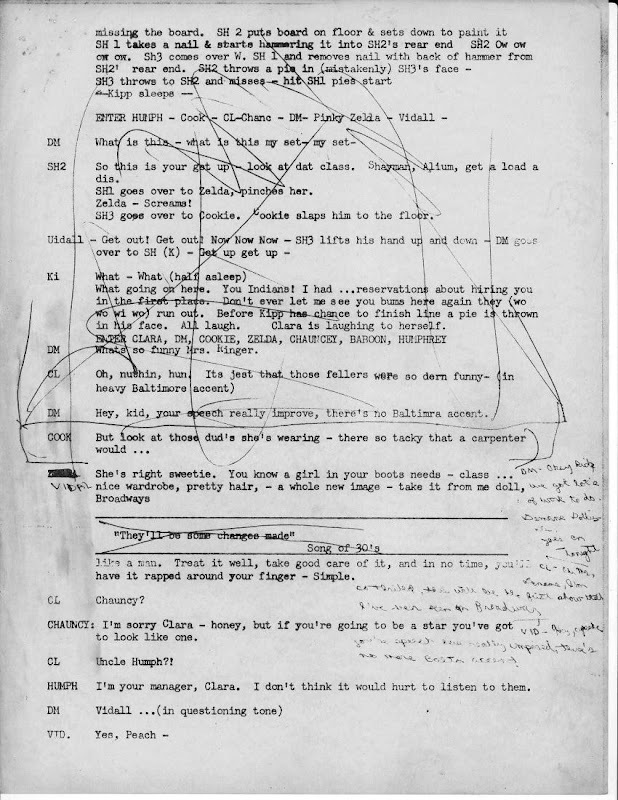 During rehearsal, various lines were cut or modified. 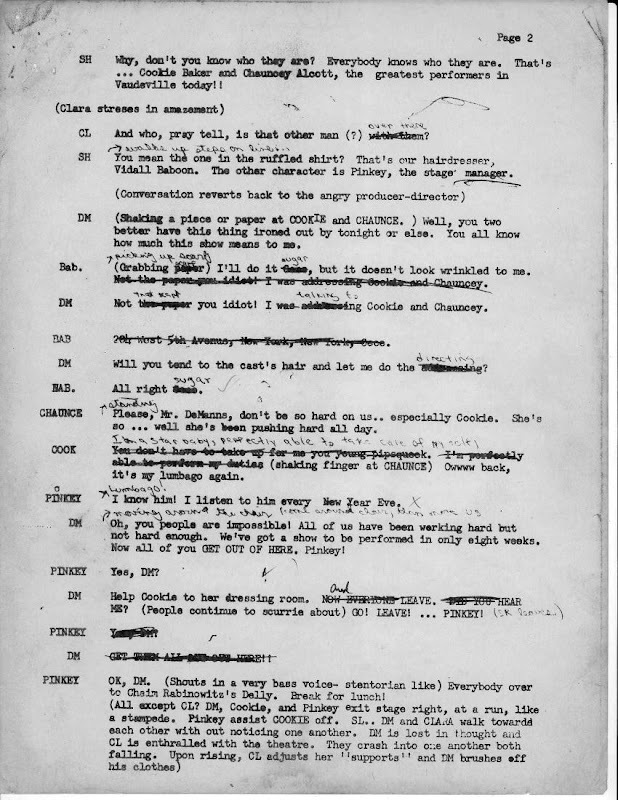 Presumably someone was tracking these edits in every copy, possibly every actor, as well as everyone on the crew who needed a copy. The jokes and gags may seen juvenile, even sophomoric (though we were high school seniors at the time), and they should. 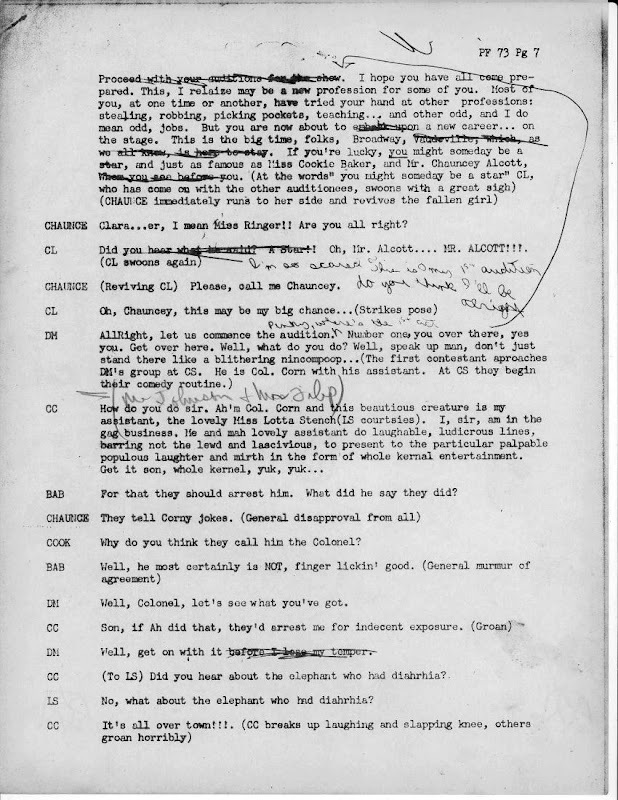 The Follies was traditionally a satire, a spoof, a what-I-later-learned-was-a pantomime, or maybe burlesque. There were traditions passed down from class to class, year to year, about the format and content of the show. It was a musical variety, with dance numbers, and showcased whatever bizarre talent we could convince the school staff to let us get away with. 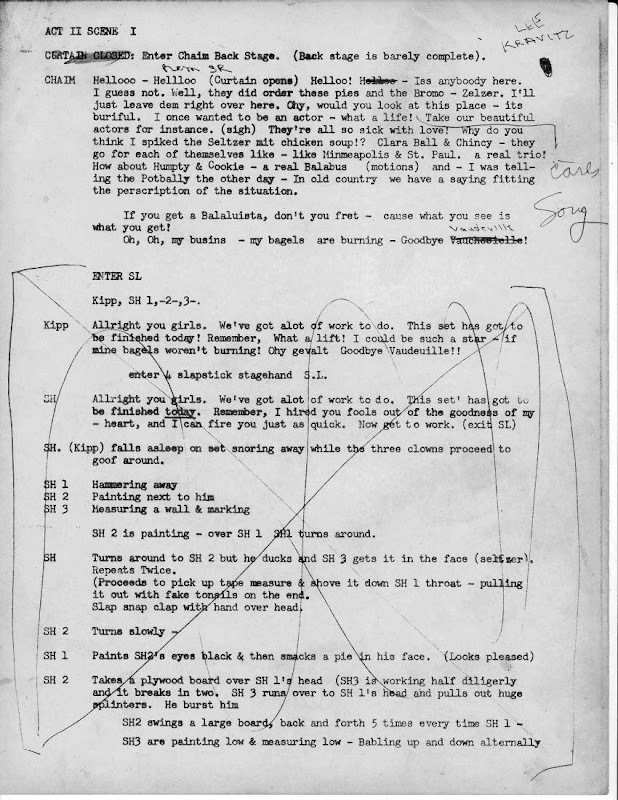 The notation for "Song: Bawlamer [Baltimore] My Home Town" (appropriately pronounced in Bawlmerese) here showcases a talent I thought I had: songwriting. I put together words, and music, on a blank notebook in G and F clefs (or something like that), and the real musicians put it into something the Poly Band (or Orchestra) could manage. Sadly, that manuscript was lost along the way. I remember where I left it, though. 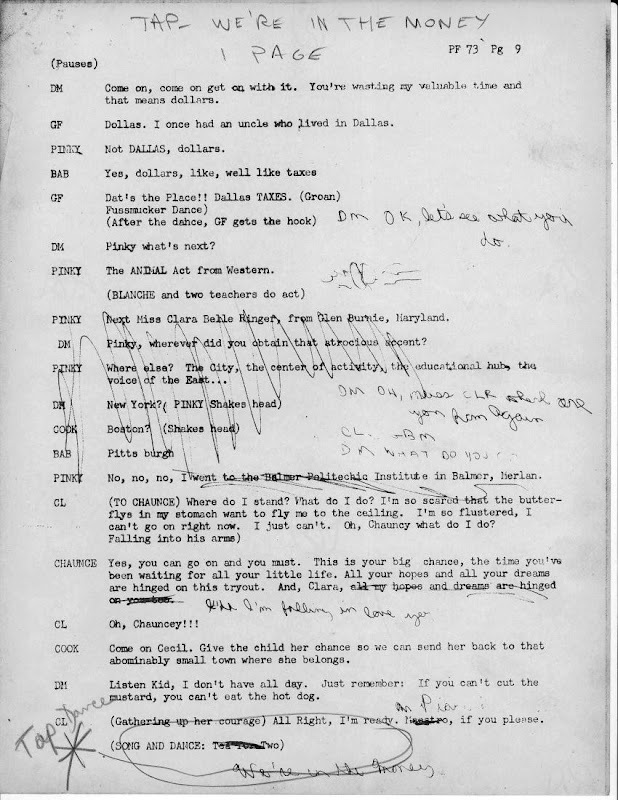 Most of this page includes stage directions, written in (by me, in my horrible penmanship capital letters) for the stage director. I recruited my brother Dave for that job, who was 2 years behind me in school (or was it 1?). Remember: Put all the "Acting Talent" into this that you have and make all practices. Make this Follies one to remember. 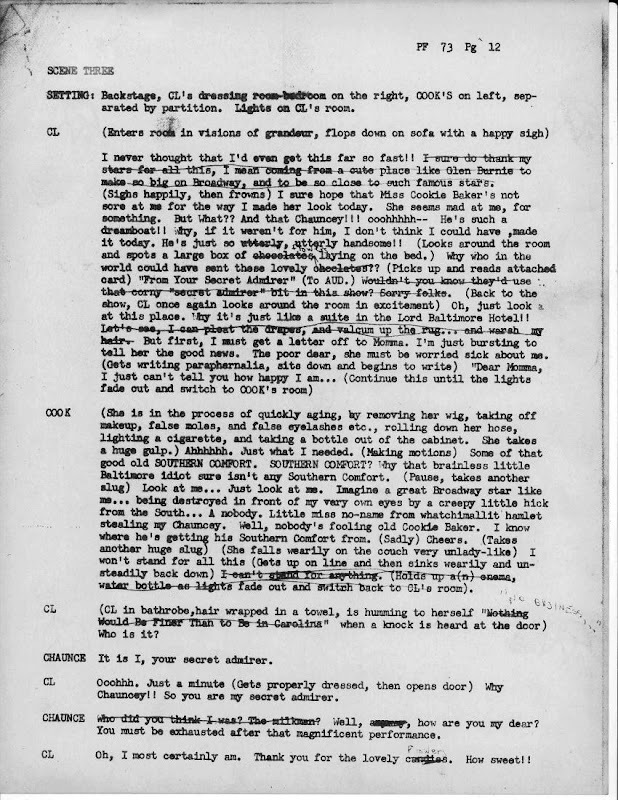 I'm not sure what happened here, as page 6 definitely ends Scene 1, with directions for "Blackout and Curtain" but Scene 2 just seems to come in with no introduction. I guess the hand-drawn line from the top paragraph means these lines are for the DM character. 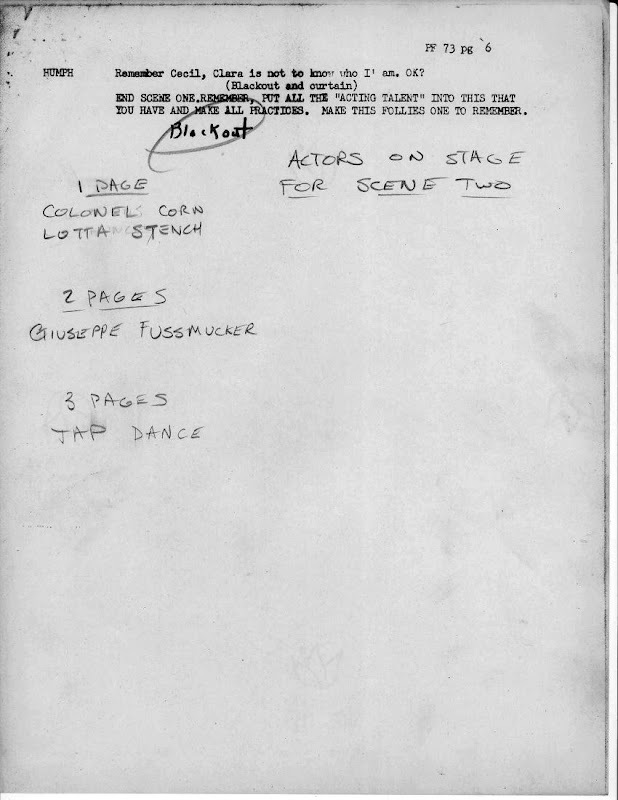 Right below that is another handwritten note, indicating that "Mr. Johnson" and "Mr. Filip" are the actors playing Colonel Corn and Lotta Stench. 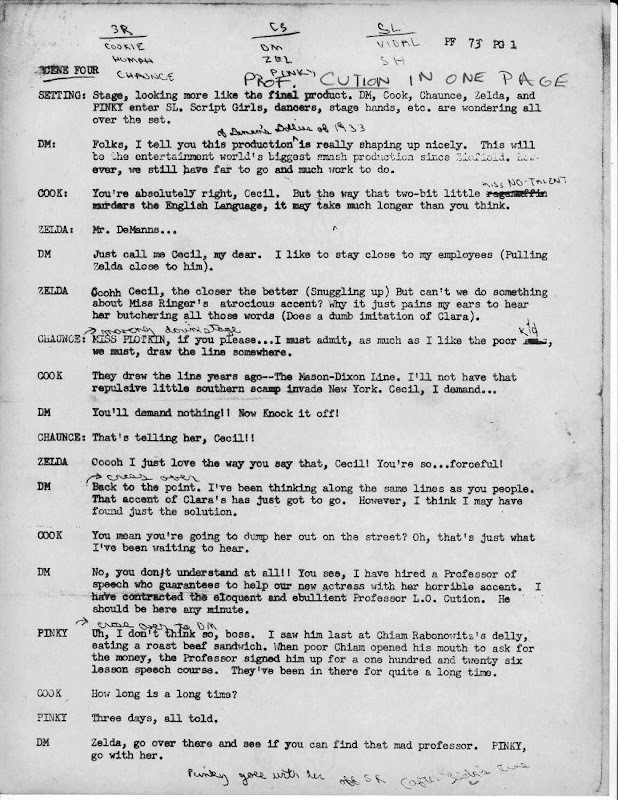 As I recall, the teachers had a tradition of doing a short skit during the intermission of the main play, though short walk-ons during the main production also occurred. And here we have Mr. Wiseman, another teacher, after the prior two leave. I don't recall us doing all the prop action we imagined when writing this ("Two bushels of corn fall from above"), but who knows? 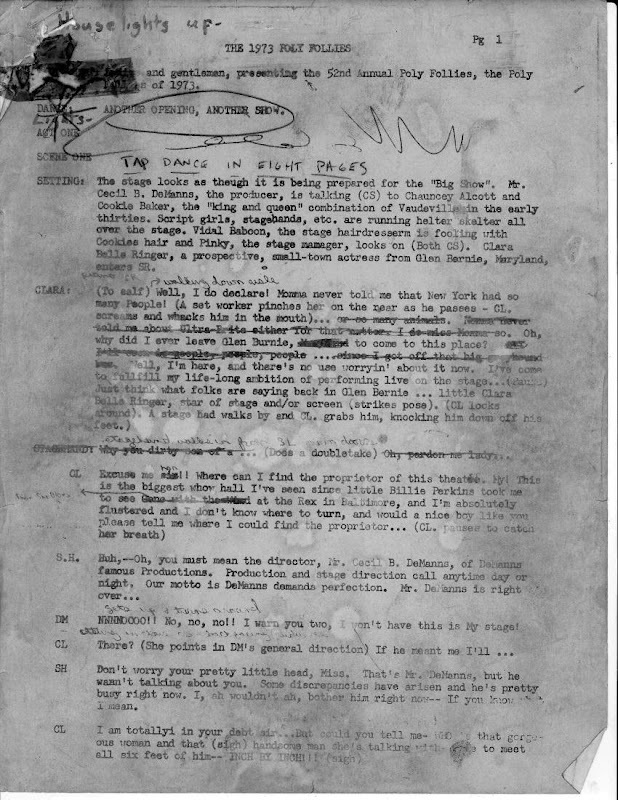 There's a stage note that the "Tap" number is coming up in one page. 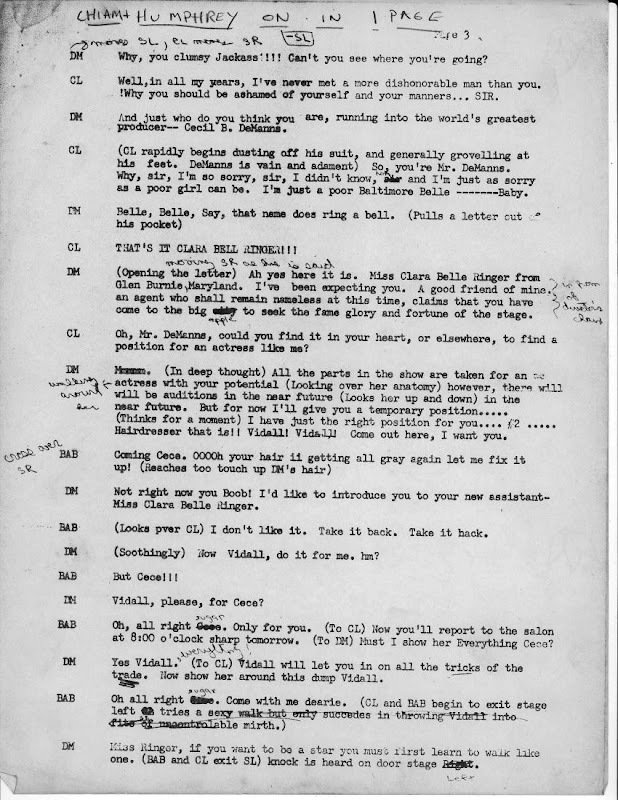 The message would have been passed to those in dressing rooms or elsewhere to go to the appropriate stage wings, in costume and ready to go on. The "Tap Dance" was set to the tune "We're In The Money", an even older tune (from the film Gold Diggers of 1933). We were shameless borrowers. One typo that I like on this page was misplacing Glen Burnie north of Baltimore, while it is definitely south of town. I am sure all three of us writers knew that, though whether the mistake was a geographic foul-up, or a mental error thinking one thing and typing another who will ever know. Catch the "down the zinc" catchphrase, a classic Baltimore mispronunciation. My family didn't pick up that one, but I have heard it and continue to hear it sometimes. 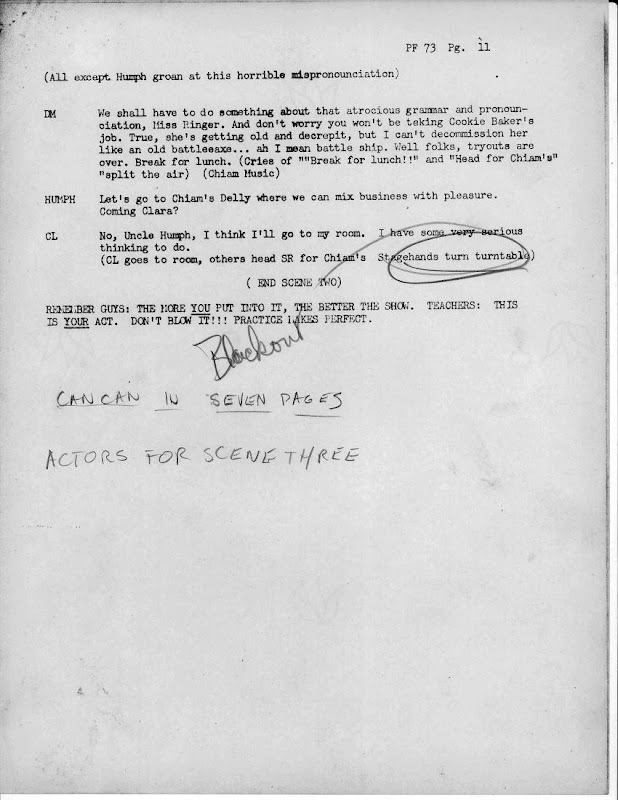 Here we have the end of Scene 2, with the directions to prepare for the "Can Can" in 7 pages, and a warning to teachers that "This is your act". Was that Act 1, or Act 2? Was there an intermission? A few lines cut here. Not much action. Yak yak yak. Love scene? Then segue to "Shadow Waltz". 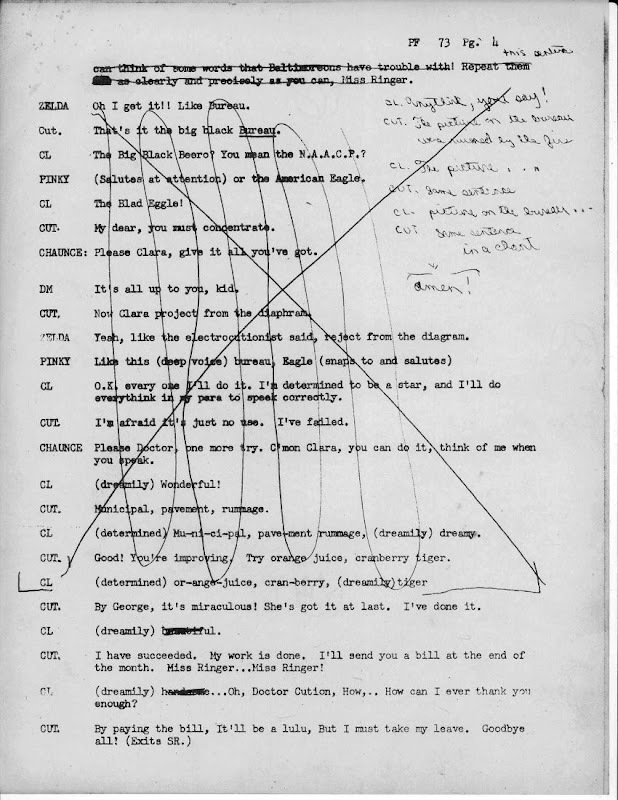 I must have totally blocked this section of the play from my consciousness. Nothing. Now into Scene 4. The stage directions have a large number of people, blocked into groups by stage right, center stage, and stage left. Not much, what snew with you? 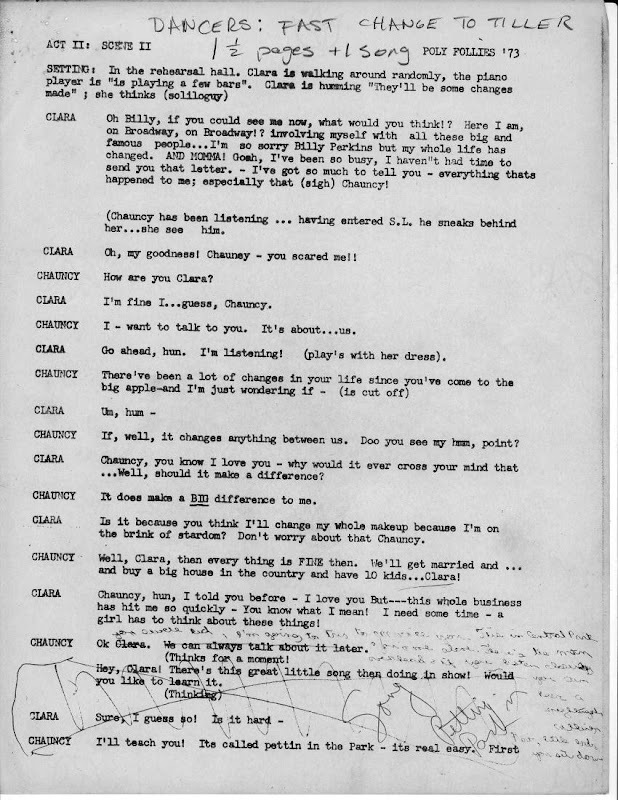 "Can Can" in one page. The Can Can dance is also a musical, per the Internet Broadway Database. Whether we "borrowed" our music and steps from that show, or from the original roots in France (or some early Western which borrowed it from somewhere else), I have no idea. It's the biggest chorus number we traditionally performed (I was in the line) and required good physical skills. We were not the Rockettes. Most of this dialog was axed. Probably a mercy killing. Intermission. To the lobby for a Dixie Cup with a piece of ice and soda from a canister. 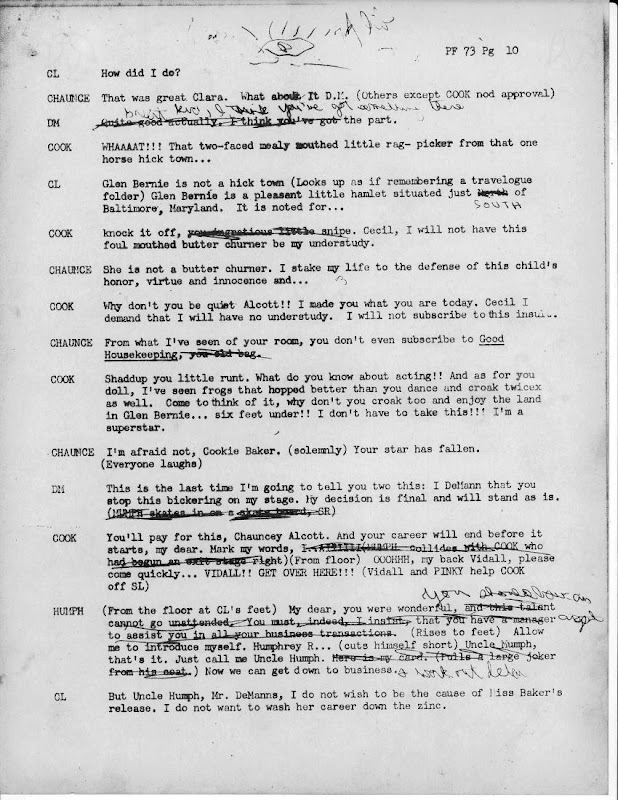 Most of this script page, that starts the second act, was dropped, though there is a musical number for Chaim, and a mention of Lee Kravitz (billed as "Student Director"). A lot more axed. Act 2 is getting short of time. 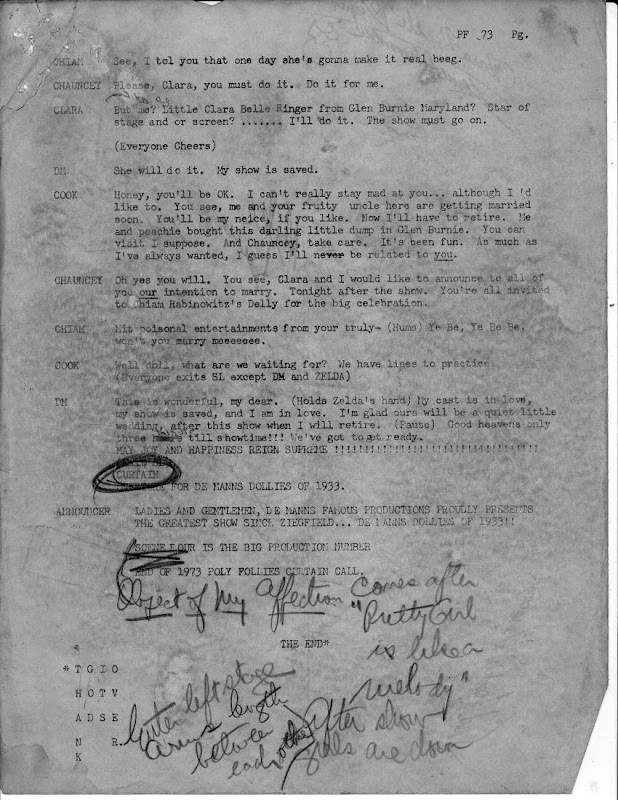 The directions call for the "Dollies" in four pages. We had a "walk down the stairs" as I recall, with large dancers making a big impression. 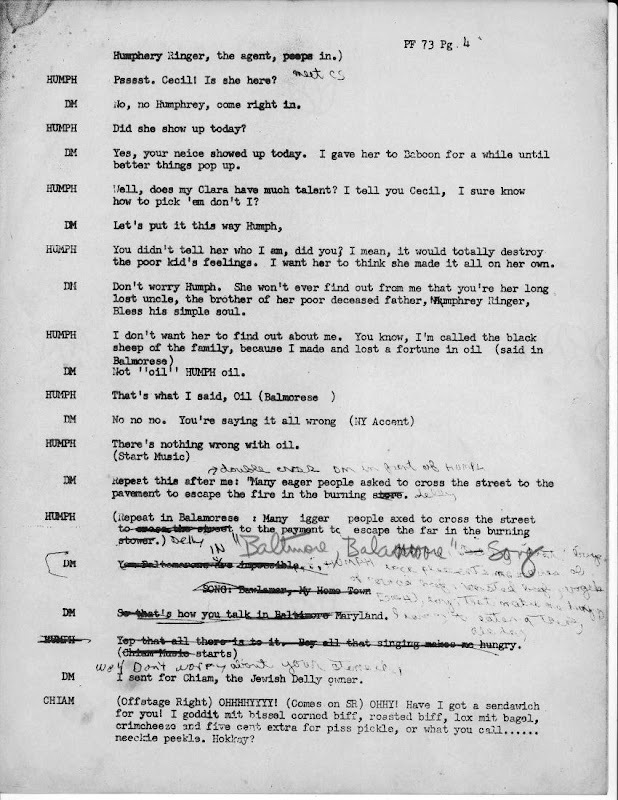 This page starts with Act 2, Scene 2. 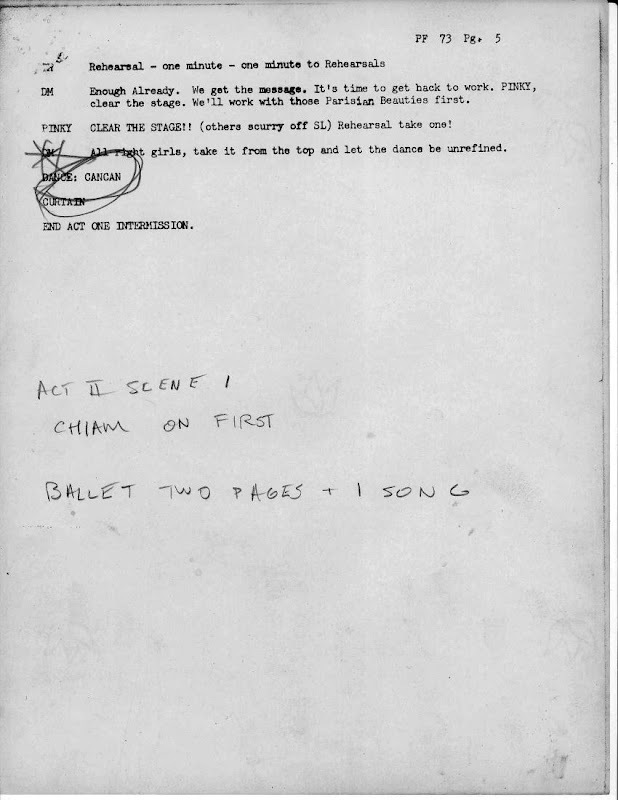 It says for the dancers to make a quick change for "The Tiller". That was more athletic than the Can Can, but just as energy draining. 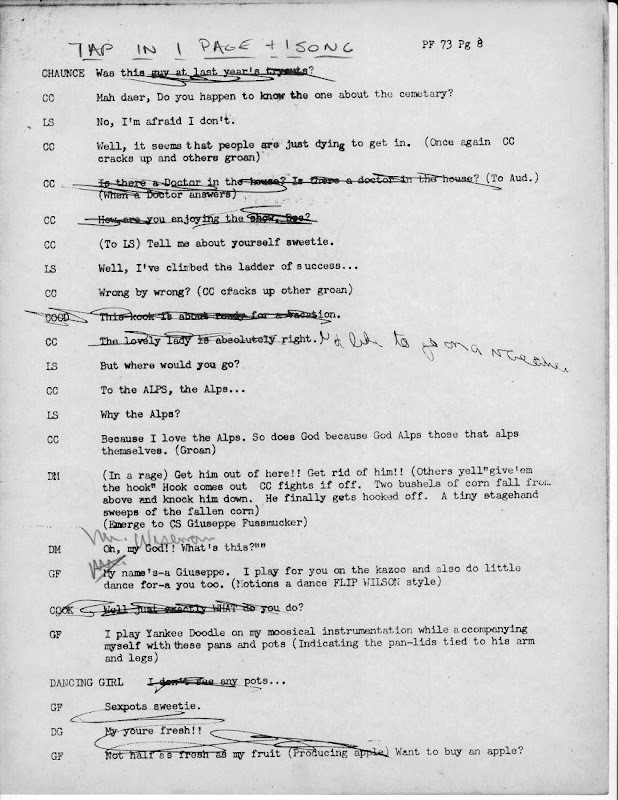 Not sure what "Kravitz, C2" has his name on this page of the script. Not as funny as the first act, I think. 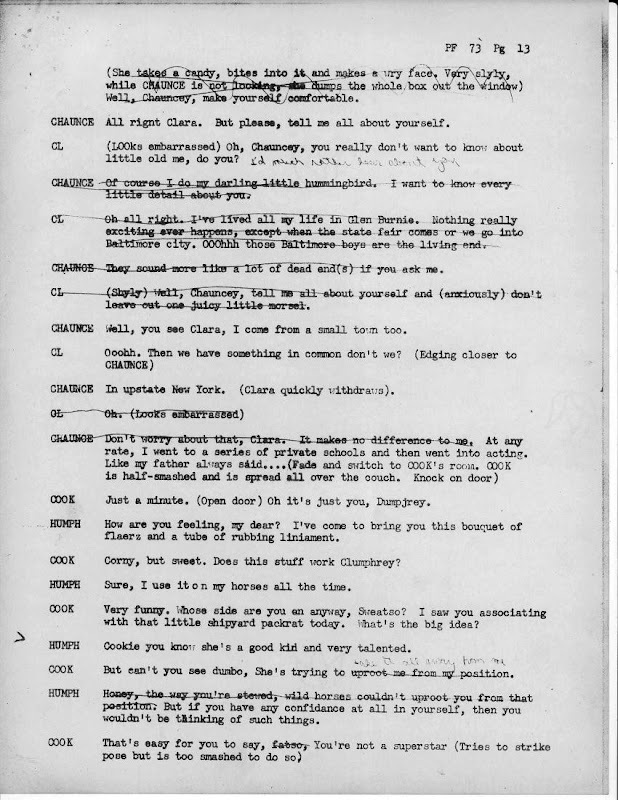 I remember how hard it was to write funny, with stage directions, character development, etc. as a teenager with no experience. We thought we could do it, and hopefully our teachers (like Mr. Jon Gross) quietly corrected our more outrageous excesses. Or kept the outrageous ones in and left out the drab ones. 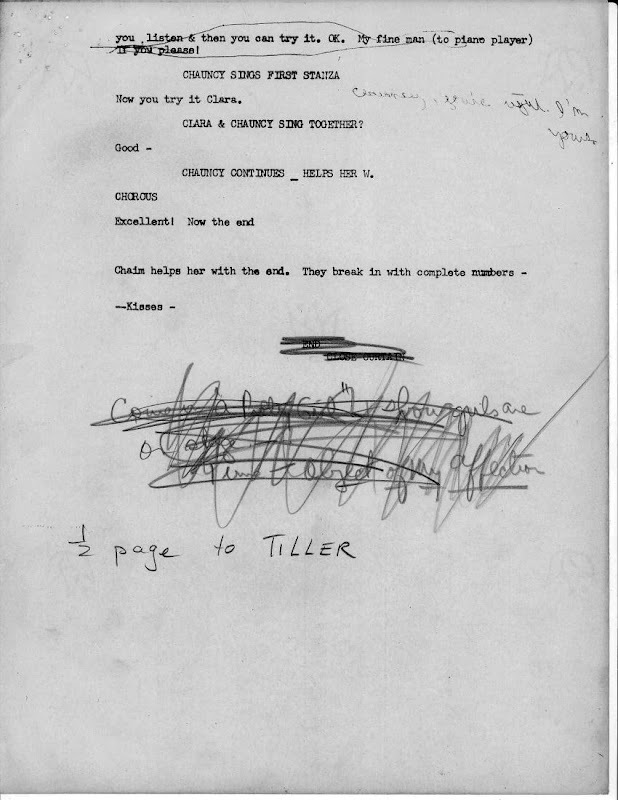 The last page of the script, and it is nearly as weathered as the first page. 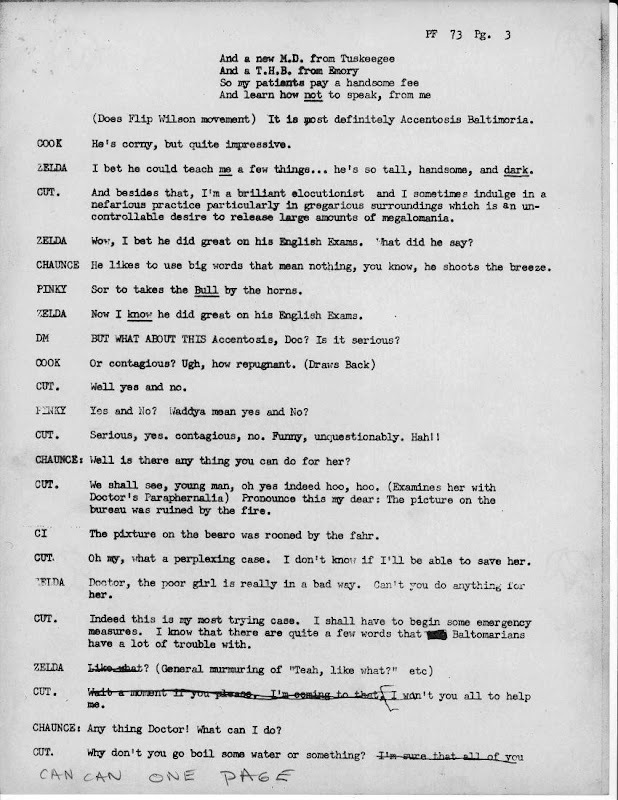 Stage directions for "The Object Of My Affections" and Scene Four is described as "The Big Production Number". In our dreams. The last spoken line, another tradition apparently (memory fails me here) is "May Joy and Happiness Reign Supreme". Why not? 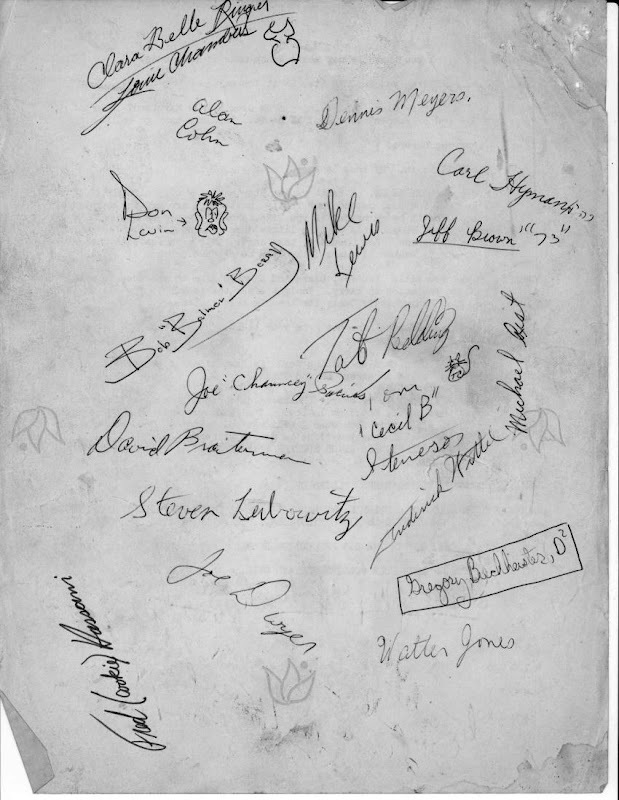 Autographs on the back of the script; the main reason I retained this artwork all these years. The program book is another story, for another day, maybe. Usually, students did the art work for the cover, and each class (that got motivated, and could afford it) bought a page, or two, and contrived to demonstrate their wit. 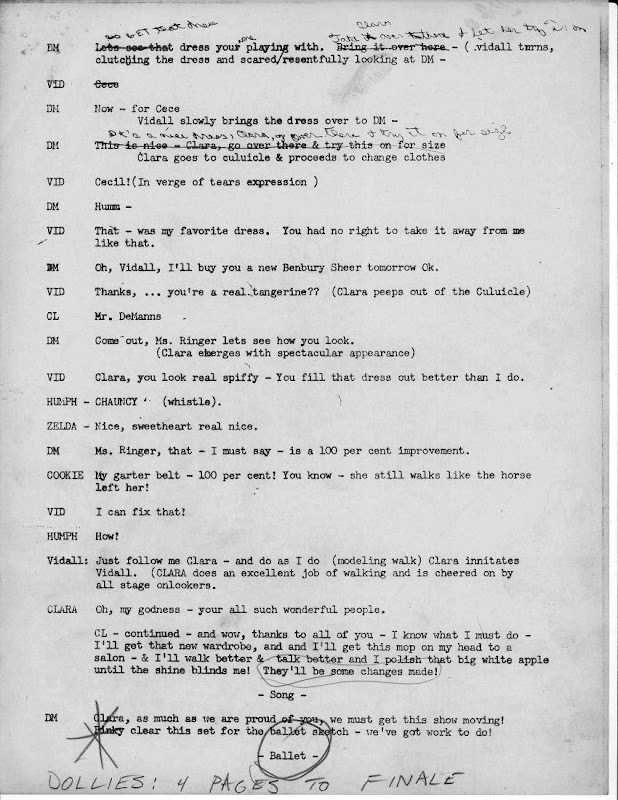 Oh, and the title of the play is "It's A Broad's Way."